Many church leaders are tired of never having enough ministry volunteers. Maybe we need to create a “yes” culture. There are times when the answer is “no”. There are situations that are not open to discussion, compromise or consideration. When considering ministry responsibility, leadership and qualifications, there are obvious cases when people are disqualified from participation. The kleptomaniac will never be allowed to count the offering! However, a “no” culture is counterproductive in ministry settings as well as being non-Biblical. In some faiths and religions, there is a distinct separation between “clergy” and “laity”. All ministry is accomplished by professional ministers, the leadership is provided by a narrow and specifically designated group. No one else need apply. If there is an inquiry about ministry involvement by the average person, the answer is a quick and resounding “no!”. The place of non-professionals is to give in the offering and submit to spiritual authority. The Protestant Reformation addressed this with the affirmation of the “priesthood of all believers”. This simply means that all believers in Christ have equal access to Christ and the ministry to which He has called His church. While most Protestant churches understand the theory of the priesthood, they have difficulty practicing it. Their leaders lead with a “no”. A “no” culture is when the first response to a ministry inquiry is automatically negative. Leaders must learn to lead with a “yes”. We must create a different culture. Past failures. History has proven that many, if not most people, fail in their efforts to be involved in ministry. Leaders have been burned one-too-many times. Confusion between excellence and perfection. The desire to offer nothing but the best to God sometimes translates into demanding perfection. Perfection is unattainable, so people are doomed to failure. Misunderstanding of priesthood. Some leaders misinterpret scripture as it relates to who is responsible for what types of ministry. Insecurities. Some leaders are afraid of not being needed. “No” is the best way to provide personal job security. There is a healthier approach available: “Yes, unless”. “Yes unless” means the that the first response to a ministry inquiry will be positive, unless there are valid reasons to say “no”. “Yes unless” creates a positive atmosphere where people are encouraged to explore ministry, leadership responsibilities and personal development. This is not a cart blanche affirmative response every time someone off the street wants to lead the church. But it is a positive initial response contingent upon certain criterion. Example: Q: “May I volunteer for the nursery?” A: “Of course! Contingent upon your tenure at the church and experience working with children and successful completion of a background security check and …” You get the idea. This affirmative response provides encouragement for the potential nursery worker while establishing high expectations. Guideline are intact. Too many times, the initial response is “no” and the potential volunteer is discouraged, if not insulted. A positive response, laying out all the expectations, can provide motivation, even for a person who is not presently qualified. While leaders must be protective of the church (“guard the flock under your care” Acts 20), we must not be controlling. God has created a “yes” culture. This explains why He chose some of the people He did in Scripture (Moses, David, Peter…). If told “no” enough times, people eventually quit asking. Is it possible that people are not asking because they assume the answer is “no”? The goal of a “yes” culture is not to lower the standards and requirements for those who lead or are involved in ministry.The goal is to equip more people for ministry and to get more people involved in ministry. Recall, the primary responsibility of “professional ministers” (pastors, teachers, etc.) is to “equip people for the work of ministry” (Ephesians 4). We are not the guardians of the church. We are not the watchdogs. We are the equippers. That means we are to help people to get from where they are to the place where they are qualified to lead in various aspects of the work of God. Are we leading a “yes” ministry culture? If not, it’s not too late to turn it around. Let’s begin today. 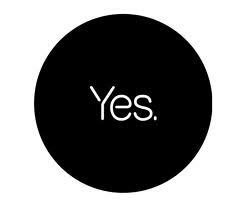 Let’s discuss some practical ways of employing a “yes” culture in our ministry setting. If I had to point to one thing that sums up all the ‘Whys” people say no, I’d say it was that they don’t know who they are or , more importantly, who God is, really. We are image bearers of God. Our identity is in the person and work of Jesus Christ, not anything of ourselves. Most of the time, we strive to put ourselves in the center of the story and pencil in Jesus Christ for a cameo. This is called Idol worship. In our culture, we’ve got an identity crisis (You could preach on this until you retire). But when Christ becomes OUR IDENTITY, then it’s impossible to make a wrong choice, any choice would be the right one. Good stuff, Jimmy. “Identity theft” takes on an entire new meaning, doesn’t it? I appreciate the feedback.